I've never tried Tibetan food before, and at one point my hometown had TWO Tibetan restaurants downtown. But we're not the most adventurous family, so I never ate there. 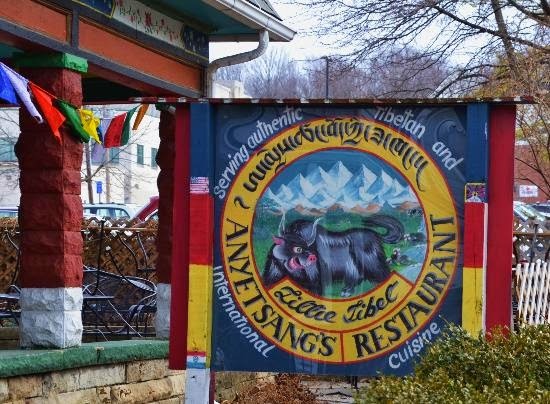 On this trip home, after picking up Sissy and her boyfriend, we decided to grab lunch at Anyetsang's Little Tibet. Located on our 4th Street "restaurant row" of sorts, where a bunch of old houses became restaurants, it's definitely not the kind of place you'd find in every city. Sorry I forgot to take an exterior photo of my own... this one is from a lovely TripAdvisor review! The menu has a lot of vegetarian and gluten-free options. There are options labeled Thai, as well as some that resemble Indian cuisine. Tibet is landlocked by other nations, so that makes a lot of sense to me! To start, I chose the Temo, which are steamed Tibetan bread rolls served with melted butter. They tasted like eating dough, if that makes sense. It was very tasty, hot, and soft. I think I might have liked them with a little honey or cinnamon sugar too! For my main dish, I ordered the Sha Balay, pan-fried dough patties filled with seasoned ground beef and yellow onion. After the temo, the portions were so big I could only eat half of the delicious patties. I liked alternating dipping them in the hot sauce and the soy sauce. To me, they tasted kind of like pot stickers or dumplings. I took the rest home, as they would be great snacks later! The service as a bit slow, and I was never brought the rice I requested, but that's okay... I had way too much to eat anyways! Overall, I'm glad I tried out the food at Little Tibet. It's funny how I never gave Bloomington credit for its food scene until I left, and I'm only now just working my way through a number of them. Just one more hometown restaurant I've been able to cross off my wishlist. That looks delicious. How funny that they have 2 and Nashville has none. I love visiting other cities and trying different foods. MY sister in law is Armenian and I am OBSESSED with Armenian food (it's a lot like greek but with more sausages and giant rice portions.) I only am sad that I can't get it here. Well, we USED to have two, but the one previously owner by the Dalai Lama's nephew (no joke) is now gone. My hometown has a Tibetan Mongolian Buddhist Cultural Center, no joke. The Dalai Lama has been to Bloomington multiple times I think! Oh, this looks so yummy! I agree with KIMMIE JONES - I am OBSESSED with Armenian food! My boyfriend's family is Armenian, and his uncle has a catering company, so my freezer stays stocked! I need to try Armenian, I never have!